Anglian Home Improvements, the UK’s leading home improvements specialist, has dramatically transformed a semi-detached property in a 3D make-over, which will visibly show energy loss in an average UK home – The first demonstration of its kind at the Ideal Home Show 2010. 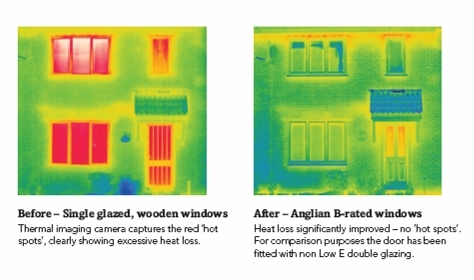 Similar properties to those housed in the Ideal Home Show Village sponsored by Anglian Home Improvements, have been photographed by a thermal imaging camera to show the extent of energy lost in a typical home. One side of the semi-detached house is functional and well loved, containing 80’s furniture and décor together with 80’s windows and doors. The other half of the property is fitted with a range of Anglian Home Improvement products to create a direct comparison and to show the huge steps in energy efficient designs over the last two decades. The modernised property is also furnished with the Ann Broad fabric range and Timberland flooring to create a striking difference and to demonstrate how homeowners can cut heating bills, reduce maintenance and improve their standard of living in an achievable cost effective way. The Ideal Home Show is recognised for its forward thinking and innovative showcasing, but this year Anglian Home Improvements have purposefully moved away from the futuristic into the factual! It is a fact that the average UK household loses around £280 worth of energy a year – every year. Much of this energy is wasted through poorly insulated windows which not only leak heat, but also money, which is bad for the consumer pocket as well as the UK’s carbon footprint. Consumers visiting the Ideal Home Show Village will see first hand the thermal properties of Anglian’s windows and the range of energy saving products that make a tangible difference to the energy efficiency of the home. These pictures show the same property before (left) with single glazing, and after (right) with Anglian energy saving double glazing windows. This forms part of the display at the Ideal Home Show Village. To see Anglian Home Improvements 3D make-over, and to discover more about how simple home improvements can make a difference to the energy efficiency of the home, visit the Ideal Home Show Village at this year’s Ideal Home Show at Earls Court from 20th March – 5th April 2010.